Tonight’s meal had the potential to be a disaster. 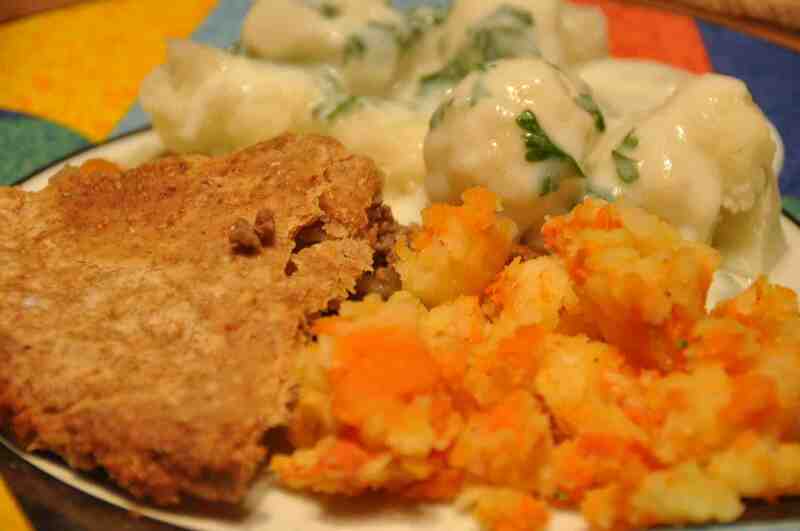 “We’re having minced beef pie, for dinner,” says I. “I’d like to have something other than potatoes tonight,” says I. (I’m a bit sick of them.) “Is cauliflower with parsley sauce okay?” What he hears is the second sentence, not the first, so when I served up a meal with no potatoes he produced a bit of a pouty lip. Fortunately, the beef pie was goooood. For pudding I really wanted rice pudding, but according to Anne (see below) that wasn’t available. I’ve been trying everywhere to get semolina instead, but couldn’t find what I needed. 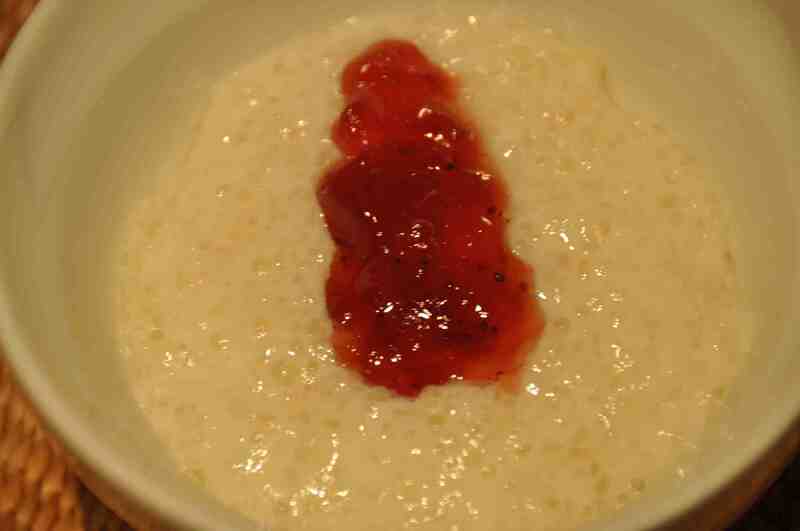 So, I don’t know if it was a cheat or not, but we had tapioca with a splodge of strawberry jam. We also nibbled on a few fresh strawberries afterwards. At this time of year they are so sweet and juicy. I can’t tell you how much I’m enjoying having pudding every evening. In ‘real life’ I rarely ever make them and was a bit anxious when I stood on the scales this morning. Turns out I’ve lost 3 lbs since starting this eating regime. I can honestly – honestly – say I’ve never felt hungry once. A few thoughts on pudding and fruit from Anne. RICE pudding? No, no. You can only have semolina (unless you stocked up before September 39). The best make of semolina was from the Marshall factories and was called Farola, but I don’t know when it came on to the shelves; a check on Wikipedia says Marshalls introduced their short-cut macaroni in 1935, but doesn’t give a date for the introduction of Farola. Strawberries, yes – but I don’t know if they reached the whole of the UK. In Kippen there was a huge fruit growers and I earned a lot of pocket money there. Lots of children helped with that harvest and most went for the big fruits like strawberries because they were allowed to eat some while they picked! I, on the other hand went for small ones – black and red currants, or jaggy ones – gooseberries, because the pay for those was six times that of strawberries. Unlike you, I love gooseberries so did eat when I got to the big juicy dessert ones – red or yellow. I suppose you got these products in shops local to such nurseries – or as far as the petrol allocation let you take them. This entry was posted in Uncategorized and tagged Kippen, wartime memories, wartime rations. Bookmark the permalink.